The days of seat belt-free buses will soon be a thing of the past. Recently, officials with the National Highway Traffic Safety Administration (NHTSA) issued a final rule to require lap and shoulder seat belts for each individual passenger on new motorcoaches and other similar large buses. Officials believe this will improve the safety of these vehicles by significantly reducing the risks of serious injury or death in the event of an accidents, including the risk of occupants being ejected during rollover accidents. “Today’s rule is a significant step forward in our efforts to improve motorcoach safety,” said Anthony Foxx, U.S. Transportation Secretary. Our bus accident attorneys in Massachusetts understand that there is, on average, about 21 people who are killed and another 8,000 injured in large bus accidents in the U.S. each year. Officials believe that by requiring seat belts, they can reduce the risks of serious injury and death by close to 45 percent. Although motorcoach travel is considered to be one of the safest forms of transportation, accidents still happen. And when these accidents happen, there is a serious risk for death and injury because of the speeds at which these vehicles travel and because of the large number of occupants on these buses. Wearing a seat belt is still the most effective way to prevent serious injury and death in all sorts of vehicle accidents, and that includes motorcoaches. This rulemaking responds, in part, to recommendations made by the National Transportation Safety Board for improving bus safety. The motorcoach industry worked with the U.S. Department of Transportation to ensure that sufficient research and testing went into crafting the new seat belt standards. In fact, most new motorcoaches sold since 2009 already incorporate three-point seat belts. The final rule will be applied to new over-the-road buses as well as other kinds of newer buses with a gross vehicle weight rating (GVWR) greater than 26,000 pounds. School buses and transit buses will be excused from this rule. It’s all a part of the Moving Ahead for Progress in the 21st Century Act (MAP-21). By 2016, all newly-manufactured buses will have to have seat belts. 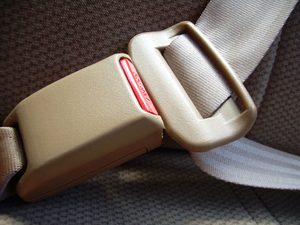 For more than half a century, seat belts have been commonplace in cars, and they have saved thousands of lives and prevented millions of injuries. It only makes sense that these devices are required on motorcoaches. The nation’s fleet of 29,000 motorcoaches transports about 700 million passengers a year in the United States, roughly equivalent to the domestic airline industry, according to the United Motorcoach Association. Since buses are typically on the road for about 20 to 25 years, it will likely be many years before most motorcoaches have seat belts. Large motor coach buses can cost as much as $500,000. Seat belts add about $13,000 to the price.